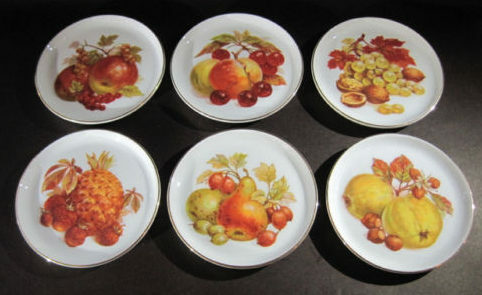 6 small dishes measuring 10cm across. These small plates were made for holding individual servings of butter. Since 1753, the famous blue “F” beneath the glazed surface on presentation plates, cups or teapots reveals that the porcelain is from the Fuerstenberg porcelain manufactory. From its inception, the Fuerstenberg brand has stood for stylish tableware. Snow-white porcelain is married with spectacular designs. 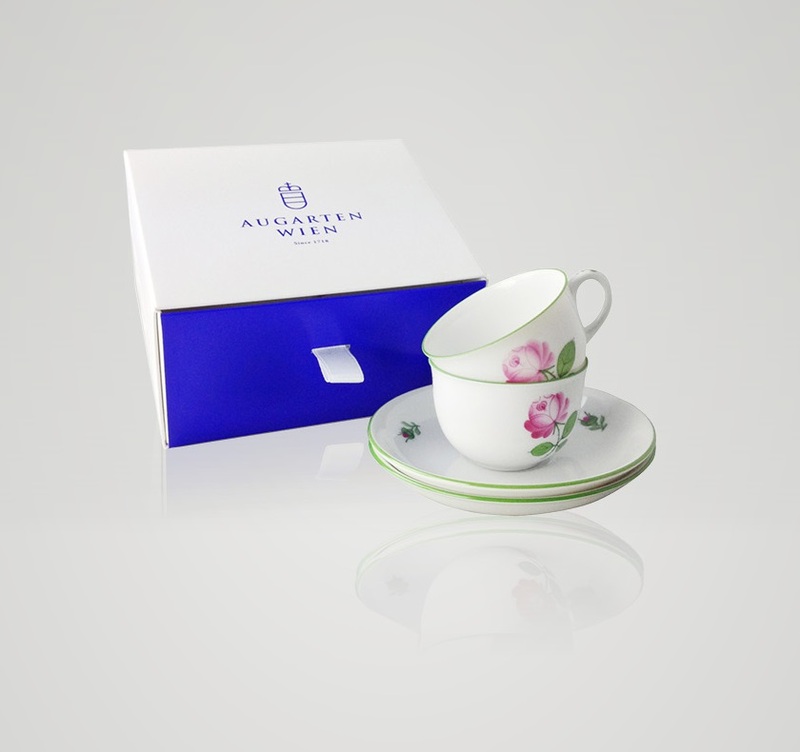 Founded in 1718, the Augarten Vienna Porcelain Manufactory is the second-oldest in Europe. Now as then, porcelain is made and painted by hand. This makes each piece unique. The designs of Augarten porcelain have been created in cooperation with notable artists ever since the manufactory first opened its doors. Artists of all epochs have designed masterpieces. The “Viennese Rose” is a famous decoration from the Biedermeier period. The Biedermeier period refers to an era in Central Europe between 1815 and 1848 during which the middle class grew and arts appealed to common sensibilities. It began with the time of the Congress of Vienna at the end of the Napoleonic Wars, and ended with the onset of the European revolutions in 1848. A retro addition to any entertainer’s home. These dishes were known as Hors d’Oeuvres dishes. Expensive for their time, they are relatively uncommon. The Sylha Ceramics Studio was run by Artur and Sylvia and was originally located in the backyard at 1 Murrumbeena Parade, Murrumbeena before moving to Natalia Avenue, South Oakleigh in 1950 and then to Warrandyte in 1958 where Artur helped to found the Potters Cottage. In South Oakleigh they employed two Italian potters and working with them, he learnt the skills of mould-making and slip-casting. Artur learned a lot from one of them, Costantino Bacchini (b: 9 September 1921) who arrived in Melbourne in 1952 under the Australian Italian Migration Agreement. 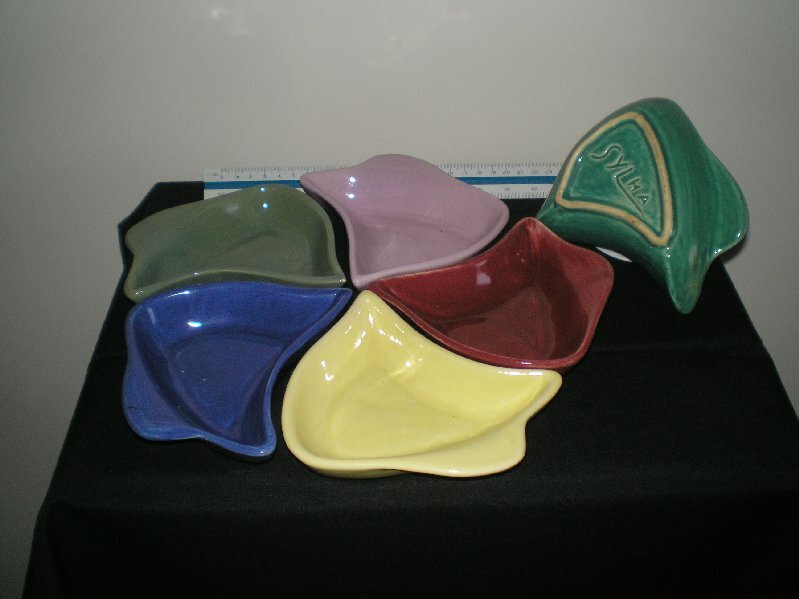 West-Australian potter Mike Kusnik also worked there in 1959. Sylvia Pauline Halpern (nee Black), was born in Kobe Japan on the 25th March 1918 and came to Australia in the late 1930s. Artek (Artur) (1908-1976) arrived in Fremantle Australia aboard the “Asturias” on the 6th March 1947. His brother Stanislaw born Zolichev Poland (1919-1969) having arrived in Fremantle before the war aboard the “Otranto” on the 15th of August 1939. The brothers were the sons of Eisig Halpern, engineer, and his wife Berta, née Gutt. 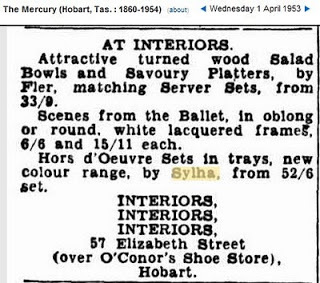 Sylvia Pauline Black had studied at RMIT under Klytie Pate and John Barnard Knight in 1944-45, and used Sylha as a brand. Artur imported great quantities of glaze colours from England and Germany as these were unavailable in Australia at the time. Like most makers of the day, their sales were made through department stores to whom they sold direct. 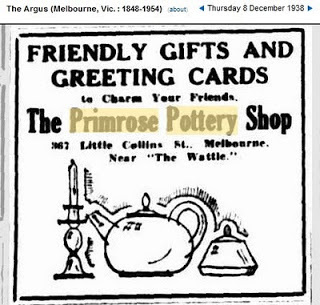 Artur sold mainly through the Primrose Pottery Shop in Melbourne. Potters Cottage was officially opened in 1958 by Dame Mabel Brookes, wife of the Governor of Victoria, Sir Dallas Brookes. It was a small miner’s cottage in Research Road near the Warrandyte Bridge. It was then known as “Moonlight Cottage”, because the gold miner who built it in the 1890s worked in the Caledonia Gold Mine by day, and built his cottage by moonlight. By 1969 the Potters Cottage Co-op had built a restaurant where people were able to have their meals served on and in the pottery that was made by local craftspeople. 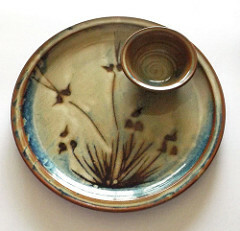 The co-operative was established for the purpose of making and selling handmade Australian pottery. The potters produced beautiful, functional studio pottery with attention to shape, decoration and glaze, bringing traditional craft together with modern. Whilst they shared certain principles in their work, the distinctive style and individuality of each artist is strongly evident. Their shared idealistic belief that modern, handmade pottery could enhance the quality of contemporary life was central to their philosophy. The Co-op built a pottery school where people could learn to make their own pottery. 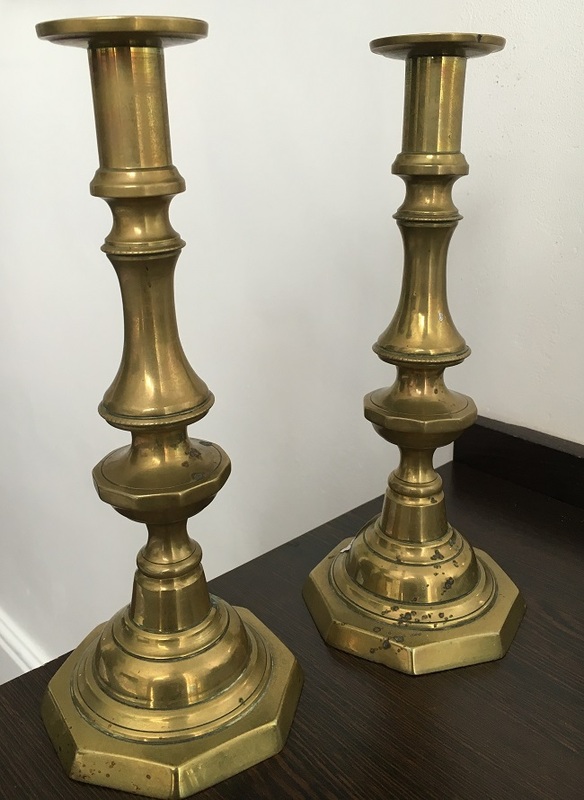 An exceptional pair of very early Brass Candlesticks. This pair of Antique 10″ tall candlesticks have their steel push-rods still intact and working. The push-rods are designed into these candlesticks so that any wax left in the sconce after burning a candle can be easily ejected to make way for the next wax candle. In 1861 the English designer William Morris started the arts and crafts movement in an effort to improve the tastes of the public. William Morris hoped to overcome the banality and inferior quality of industrially produced decorative arts by promoting a return to medieval style craftsmanship. The Gothic Revival had a great impact on the Arts and Crafts style. The interest in all things Medieval and the use of bold forms and strong colours were particularly inspirational. 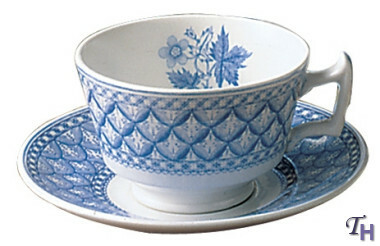 Introduced by Spode circa 1820. A sprig of geranium surrounded by a border of radiating geometric shapes. 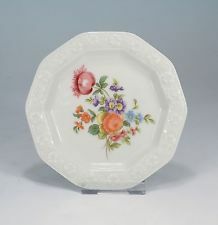 Plate with Geranium border surrounding the central Skinners Coat of Arms – To God Only Be All Glory. Backstamp: W T Copeland & Sons Stoke on Trent England and impressed Copeland. Rosenthal GmbH is a German manufacturer of porcelain and other household goods. 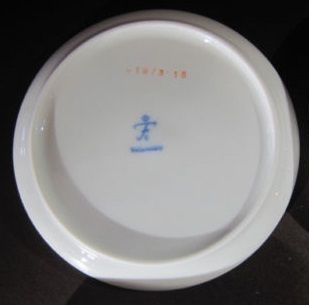 Founded in 1879 as a family business by Philipp Rosenthal, who moved his porcelain painting from Werl (North Rhine-Westphalia) to Selb in Bavaria. 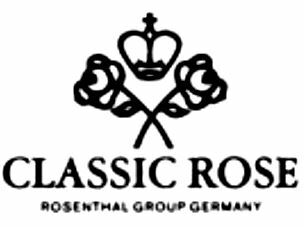 In 1897, Philipp Rosenthal founded the company Bauer, Rosenthal & Co. in Kronach. The Rosenthal Archive, a collection of around 15,000 exhibits from 130 years of company history, were purchased by the Oberfranken Foundation on 12 August 2009 and is provided as a permanent loan to the Porzellanikon, the State Museum of Porcelain in Hohenberg an der Eger, Selb. These include nearly all product designs, from the company’s foundation. 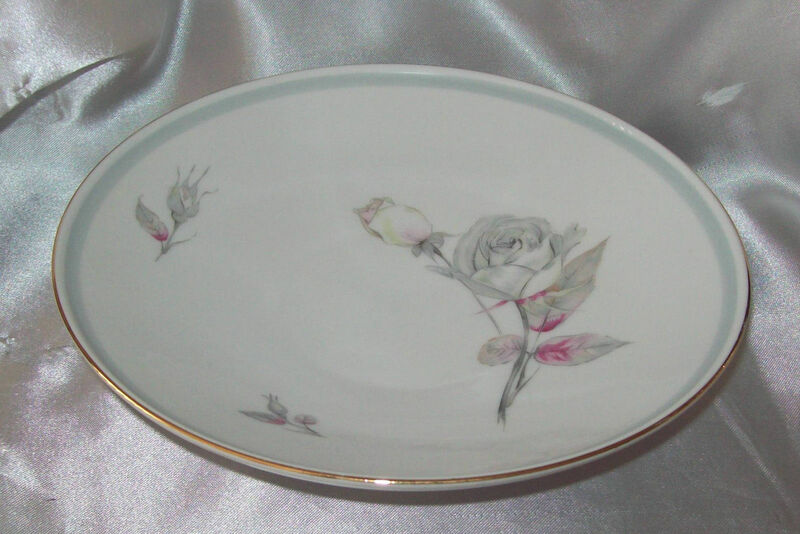 Large 34cm dip platter, with printed backstamp. Danny Ortiz and his wife Karen operate a working pottery studio, gallery and cafe at Grovedale, Victoria. 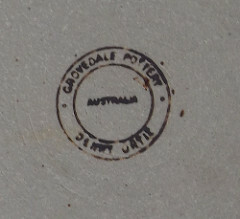 A potter with many years’ experience making wheel-thrown and handmade stoneware pieces, Ortiz marks his work with a printed stamp reading ‘Grovedale Pottery Australia Danny Ortiz’. Framed by an 18th century Chinese border, the central scene of Italian ruins was inspired by a 17th century drawing. 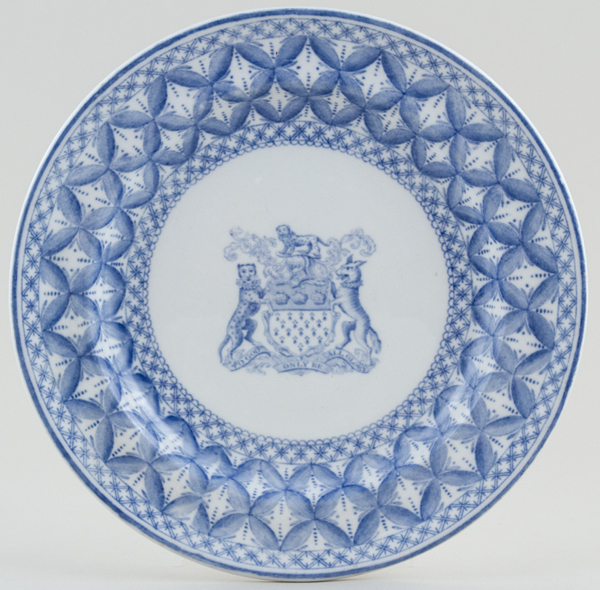 Launched in 1816, Blue Italian is one of the collections that secured the reputation of Spode as a leader in the ceramic industry. In 1784 that Josiah Spode perfected the process of underglaze printing on earthenware with tissue paper transfers made from hand-engraved copper plates. 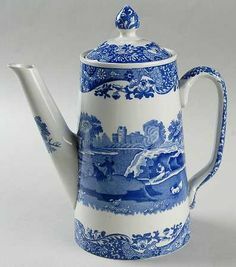 Initially the designs were sympathetic reproductions of the Chinese porcelain that had been incredibly popular during the 1700s, but soon Josiah launched original designs such as Willow and Blue Italian. Now considered a design icon, Blue Italian is inspired by scenes of the Italian countryside featuring remarkably detailed figures amongst Roman ruins and framed by an 18th century Imari Oriental border. 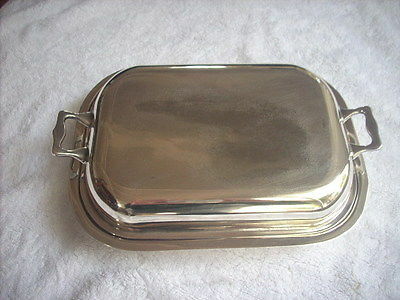 Silverplate from Hecworth was advertised in 1936. “Hecworth” was a brand name sold through a shopfront in Collins Street Melbourne. Hecworth plate was made by Platers Pty Ltd in the Melbourne suburb of St Kilda at 39 Greeves street. The “Hecworth” brand was taken over by Rodd Pty Ltd in 1940. 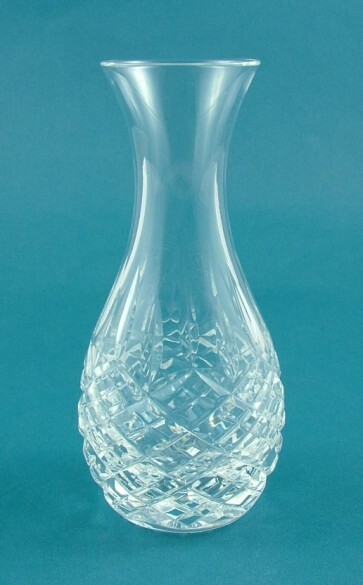 This cut lead crystal bud vase from the ‘Shaftesbury’ suite by Stuart Crystal has an everted rim, tapering in to a waisted neck and broad bulbous body with a lattice formed from five rows of interlocking diamond shaped panels surmounted by an elongated vertical wedge cut. The base of the vase is thickened and star cut. It is marked on the edge with the word ‘STUART’. 4.0cm and across the base of about 3.7cm. The Stuart story started in 1827 when eleven year old Frederick Stuart was sent to work on the ‘crystal mile’, an area just outside Stourbridge where generations of local craftsmen had already made this the centre of English Glassmaking. Over the years the skills and techniques of hand-gathered glassmaking remained virtually unchanged, a tradition to which successive Stuarts added unique creativity and innovation.